In the 2011 census, 40.2 per cent of dwellings in South Perth had one motor vehicle, with about 50 per cent having two or more vehicles. 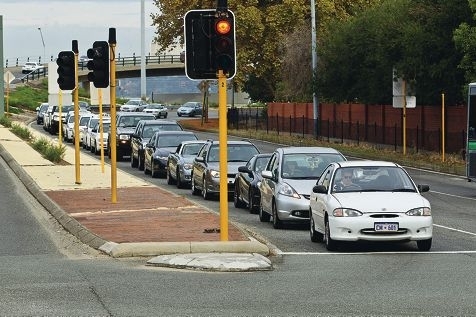 Although the City of South Perth said it had not noticed much of a change in traffic, it said the freeway entry point remained an area of congestion. ‘The City has concerns that congestion in this area will increase with the closure of Riverside Drive,’ South Perth Mayor Sue Doherty said. ‘With no northbound ramp to the Kwinana Freeway at Canning Highway, additional traffic is being directed through the City. In recent years, the City of South Perth and South Perth MLA John McGrath have urged the State Government to fund a Kwinana Freeway southbound on-ramp at Manning Road. During the 2013 election, Mr McGrath told the Gazette his was disappointed the Manning Road on-ramp was not included in the transport budget for 2012-13. ‘However, I will continue to push for it to be funded in the near future,’ he said. Mr McGrath also had concerns that unprecedented population growth had resulted in a rapid increase in vehicle numbers, which was having an effect on traffic movement on Mill Point and Labouchere roads. Cr Doherty added the entry to the freeway along Labouchere and Mill Point roads can be ‘slow and bank up’ during the morning peak hours, with queue lengths sometimes extending beyond the intersections. A Main Roads spokesperson said there have been no reports or evidence to show any recent increase in travel times or unusual traffic congestion on the section of the Kwinana Freeway between Mill Point and Mounts Bay roads.